It’s Friday, and that means another indie author interview! Today I have Nicholas Andrews, fantasy writer with a few series out. You can find out more about Nicholas at his blog here: www.authornicholasandrews.com . Hey, I appreciate you featuring me on your site. 1. What first got you into writing? Oddly enough, it was fantasy-based video games. I was playing The Legend of Zelda, Final Fantasy and Dragon Warrior when I was in elementary school. Most of what I read at the time was for book reports, and I would basically read whatever my mom brought home from her classroom, which tended to be middle-grade horror. I didn’t even know fantasy literature existed yet, but liked it enough through video games to make up my own stories. Eventually I discovered the genre when I began discovering my own reading material, and that’s when the dream of writing books began. 2. As a reader, what are your favorite kinds of books? Why? I enjoy fantasy the most because it’s the type of genre that can be anything or a little of everything. You want adventure, action, romance, mystery? You can find it. 3. I see that you’ve started a new series, the Law of Eight. Tell me about that. Well, it’s going to be a five-book series. I released the first novel, Secrets of the Stonechaser, back in December 2013. It’s about a mercenary named Nerris who used to be part of a famous group of adventurers. He is at a point of absolute despair in his life, but finds a purpose in attempting to guide the conscience of the leader of a rebel army, Lady Qabala, a young woman who walks the edge of morality in many ways. Eventually Nerris meets up with his old friends and they decide to go on one last treasure hunt, along with a mysterious sorceress named Len-Ahl. Of course, they then find themselves on a journey, caught up in momentous events that will end up shaping the fate of the world. I released Book 2, Follow the Faery Footpath, last month and it continues the story of their journey. 4. Is all your fantasy set in the same world? Why or why not? 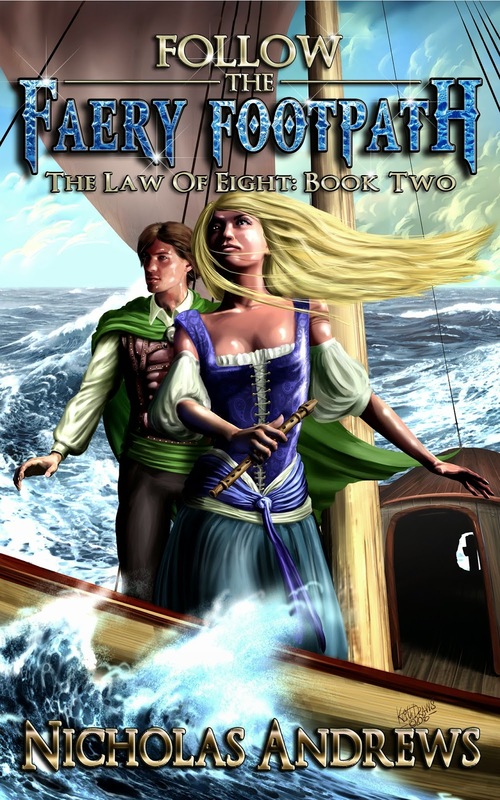 The Law of Eight and my novelette series The Thrillseekers: Cadets of Gauntlet are in the same world. Cadets of Gauntlet is a prequel, taking place fourteen years before the main series. It shows Nerris and the Thrillseekers’ lives before they were famous as they attend a famous fighting school. The Adventurers is its own separate world, due to the light, humorous nature of the stories. Though in a fantasy setting, the world more closely resembles ours in the way people think and live. They enjoy a lot of the same things we do in the modern day, such as rock music, fast food, pro wrestling, television, etc. but use magic to get around technological issues. 5. What kind of process do you go through in writing each book? First I make an outline that I never finish. I get two-thirds of the way through before I get bored, but I usually know how it’s going to end anyway. I’m writing the third book in The Law of Eight, and I think this is the first time I’ve actually finished an outline. But so much stuff goes down, especially toward the last half of the book, that I needed to get it all on paper so I could figure out what story beats should go where. There’s also a bit of seat-of-my-pants writing going on if I get a new idea or I realize something’s not working. Next, I write the rough draft itself, posting chapters as I go on a writing critique site I belong to, to get feedback and catch mistakes. I tend to revise as I go, so I don’t write in terms if second or third drafts. Then I’ll give myself some time off from the manuscript so I can look at it with fresh eyes. After that, I give myself a month or two to make revisions before letting someone else look at it. At some point in the interim I take care of cover design. When all that’s done, I pick a release date. 6. Tell me what you’re working on next. Like I said, I’m working on the third book in The Law of Eight, and I’m aiming for an early 2015 release. The third installment of Cadets of Gauntlet should be out within the next couple of months. 7. What is something that would surprise your readers to know? That I’ve actually been writing since I was about twelve, so close to twenty years. But it took me until my mid-twenties until I began to write anything even remotely publishable. I wrote the first version of Secrets of the Stonechaser between age 17-21, but it only ended up being 64,000 words, barely even a novel. It moved through things too fast, and while I wouldn’t call the writing awful, I just hadn’t matured yet as a writer. I knew if I wanted to do this right that I would need to rewrite it completely from the ground up. So that’s what I did a few years back, and now it’s about 110,000 words, everything is much more fleshed out, pace, characters and dialogue have improved, and is much better off for taking the time and effort to do that. Some of the responses I’ve gotten have validated that. For example, someone tweeted to me that it was one of the best fantasy books they’ve ever read. Of course, they didn’t rule out that it may have been one of the ONLY fantasy books they’ve ever read, but I’ll take what I can get. Don’t publish before you’re ready. It’s not just validation from beta readers or editors that determine when you’re ready. It’s something you have to ask yourself and dig deep down to answer honestly. The downside of self-publishing is that a lot of rough drafts and bad writing get thrown up on Amazon way before the stories are ready, or before the writer’s skills have matured. Most of these stories get bad reviews and sink to the bottom of the charts. The writers then get discouraged because they’re not making any money and everyone is telling them their writing stinks. Many give up at that point. You don’t want to be this writer. This entry was posted in Author interviews, books, indie authors and tagged fantasy. Bookmark the permalink.